Once a flood victim herself, civil-engineering student Anelle Concepción now uses her studies to make families, buildings, and communities safer from floods. Photo by Brad Slade. How Anelle T. Concepción (’19), a quiet civil-engineering student raised by a single mom, ended up in her major is a quite a story. It involves long odds, revelation, and help from the larger BYU alumni family back home. But to tell that story, another story needs telling first. On the rainy night before New Year’s Eve in 2005, 9-year-old Concepción was spending the night at her grandparents’ house nearby her own home in Vacaville, California. In the wee hours, while her mom and older brother slept, their home began filling with water from a flooded creek. They awoke and, not wanting to let more water in, didn’t open the door; but when the water rose higher than 3 feet, the doors wouldn’t budge. Her mom and brother got on the couch and floated, worried about the electric current. Sadly, the family lost everything: the home, baby books, family photos, clothing, furniture. Concepción’s mother, already on a meager salary, has never recovered financially. All through high school Concepción worked 30 hours a week in a grocery store to help out her mom. After joining the Church, Concepción decided to apply to BYU on the recommendation of her bishop. Up against the deadline, she took the ACT cold turkey that next weekend and soon found herself admitted to BYU, a major transition for a first-generation college student. She declared chemistry as her major, then premed. But neither was what she wanted to do. But how to know? Concepción left BYU to serve a mission in Albuquerque, New Mexico. Before coming home, her mission president felt inspired to give her a blessing in which he told her she would receive a revelation about her vocation. Determined to find out as soon as she could, she fasted and prayed and turned to the scriptures. She pulled out the Book of Mormon, turned to a random page, and put her finger on a verse. There, in Ether, the Lord told the Brother of Jared to build special boats. Concepción interpreted that to mean civil engineering. 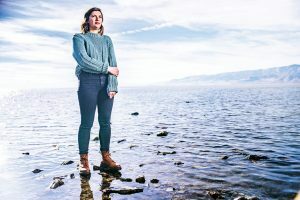 Returning to BYU, she began the grueling civil-engineering major, difficult for anyone, but especially for a working student with little financial support. Seeing a need, the BYU Alumni Sacramento Chapter provided her with a replenishment grant, enabling her to persevere. Still, difficult math, physics, design, and computer courses required complete dedication and meant no social life. Concepción began to question whether this was the right path. Getting to the university from a place of disadvantage was already a victory, but turning a childhood tragedy into a way to bless others is thrilling for Concepción, and it provides a way for her to reflect the generosity of the local alumni chapter that blessed her. As with the construction of the Book of Mormon boats, Concepción is now working so that none will “perish in the flood” (Ether 2:20).